There are three great truths that all Christians—who want to be called Christians—must believe: 1) that God, who created all things from nothing, exists; 2) that we possess an immortal soul and are destined for eternal life; 3) that Jesus is the predicted Messias or Christ and suffered enormously for our salvation. There is, in reality, a fourth: that the first three are not part of a take-it-or-leave-it system. Belief is not optional! And as we shall see in this matter, Our Lord’s patience is not unlimited. In the first three parts of this essay, we have asked the reader to consider the spiritual aspects of numerous recent tragedies, a normal request to anyone who prays to God for assistance. We should also apply a providential element to the study of ancient history. Otherwise we could not properly account for the rise and fall of so many brutal empires in the pre-Roman era, nor for the enormous influence of an obscure Jewish religious leader from the hinterlands of the latter empire who changed the direction of the world. With the Incarnation, Divine Providence and Divine Revelation combine, come to life, and provide a Christian view of history which will record the conflict and tension between the Law of God and the spirit of evil in the world. But although the Incarnation is the central event, the linear view of history began with the prophets of the Old Testament, especially Isaias and Daniel. At the time of Isaias (c. 700 B.C. ), the mighty kingdom of David and Solomon had split into two smaller, vulnerable kingdoms: Israel in the North with ten tribes and Juda with two tribes, but also the fortress of Jerusalem, in the South. Both kingdoms incurred severe denunciations from all the prophets of the period for their attachment to immorality and idolatry. In the Northern Kingdom, Amos the earliest prophet, emphasized God’s authority over the universe, Israel’s obligation to Him and that God would protect those faithful to Him, but to no avail. With the terrible Assyrian army rampaging westward, its chaotic decline continued and its political stability deteriorated despite prophecies that Assyria had been chosen by God as His instrument of chastisement. Finally, in 721 B.C., the infamous warrior Sargon II crushed Israel’s capital city, Samaria, and after impaling most of the inhabitants, carried off the remainder. The Ten Tribes of Israel disappeared forever from the pages of history. Isaias’ great contribution to prophetic literature lies in two areas. The first records his heroic efforts to maintain the fighting spirit of Jerusalem in the face of Assyrian encroachment. The second is concerned with his amazing predictions of Christ’s mission and divine nature. Assyria, the third of Mesopotamian empires, easily ranks as the most brutal and rapacious. Sumer, famous for inventing written, phonetic language around 3,300 B.C. and Babylon, noted for its lawgiver and king, Hammurabi, preceded them. The last, the Neo-Babylonians or Chaldians, we will study in connection with Daniel. The moral and political deterioration in Juda paralleled that in the Northern Kingdom. One King, allowed his son to be butchered to appease the Canaanite god Moloch. After the fall of Samaria in 721, the situation became precarious; so much so that very existence of the chosen people stood on the brink of annihilation. At this moment God sent Isaias. This magnificent prophet of God warned that if the kingdom were to escape destruction it must follow one guiding principle: confidence in God and not warlike preparation nor concessions to Assyria. But the people were obstinately attached to their evil ways. Isaias warned that the time of God’s judgment was coming and would leave the kingdom in ruins. The scourge was even then descending, and the scourge was Assyria (the rod and staff of my anger—Isa. 10:5). Sennacherib, Sargon’s successor, reduced all the cities in Juda and then besieged Jerusalem. The people wanted to surrender, but Isaias urged them to resist. “Thus sayeth the Lord concerning the Assyrians: He shall not come into the city, nor shoot an arrow into it,” and it came to pass that night that an angel of the Lord came, and slew in the camp of the Assyrians tens of thousands. The next morning Sennacherib withdrew; Jerusalem was saved. However, Isaias’ divinely inspired pronouncements went far beyond his warnings of moral failure and imminent chastisements, for in memorable passages he proclaimed that God himself would come in His own person to redeem mankind. With remarkable accuracy, he revealed, “Behold, a virgin shall conceive, and bear a son” (Isa. 7:14). “For a child is born to us…and his name shall be called, Wonderful, Counselor, God the Mighty…He shall sit upon the throne of David, and upon his kingdom; to establish it and strengthen it with judgment and with justice, from henceforth and for ever” (Isa. 9:6-7). Concerning Our Lord’s passion he prophesied, “Despised, and the most abject of men, a man of sorrows…he hath borne our infirmities…he was wounded for our iniquities, he was bruised for our sins…and by his bruises we are healed…The Lord hath laid on him the iniquity of us all…He shall be led as a sheep to the slaughter” (Isa. 53:3-7). Several times the Evangelists quoted the prophecies of Isaias in their Gospels, but the most remarkable reference came from Christ himself. Our Lord in the early days of His Galilean ministry, visited the synagogue in His hometown of Nazareth (Luke 4:16-30). As a visiting dignitary, He was asked to read a passage from the Old Testament and then to provide a commentary. Quite appropriately, the selection chosen came from one of the more descriptive revelations of Isaias (61:1-2). Of the six clauses in the prediction, three require some attention, the first two and the fourth. With infinite wisdom and love and omnipotent power, Christ certainly explained that the coming Messias must become the center of life from whom all draw their vital energy. He came not to enhance the possession of worldly goods but to provide for the spiritual life by giving sanctifying grace to the soul. The fourth clause mirrors verse three of Psalm 146, “He heals the broken heart and binds up their wounds.” The primal cause of sorrow results from the fall of Adam: sin and death. Without the promise and coming of Christ, humanity’s condition would have been hopeless. Separate our destiny from Christ and life becomes a dreary waste. Recurring tragedies throughout the world today give examples from Syria where the government fires on its own citizens at night from tanks and snipers to the terrible famine in the horn of Africa. When man suffers, he naturally turns somewhere for consolation. Christ would have us turn to Him. At the end of the discourse, He made the astounding statement that he, in effect, the man standing in front of them, was the Christ foretold by Isaias. Instead of falling on their knees, they gave in to their superficial, carnal instincts. The congregation rose up in anger, grabbed Our Lord, rushed him out of town and attempted to throw Him off a cliff. During the melee, He mysteriously disappeared. During the discourse, Our Lord further angered the Nazarenes by observing that in the time of the prophet Elias, a great famine spread through Israel. However he helped none of his countrymen but assisted a widow and her son in the Phoenician city of Sidon. Likewise his disciple Eliseeus ignored the lepers of Israel but cured Naaman the Syrian. By this testimony of approval, Our Lord indicated that not only were the prophesies of Isaias inspired by the Holy Ghost but also that the other prophets were also sent by God. 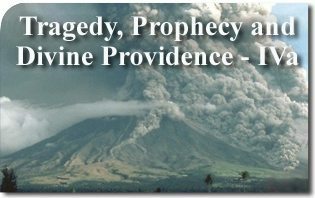 This entry was posted in Catholic Perspective and tagged Divine, Prophecies of Tragedy, prophecy, Prophecy and Divine Providence, Providence, Tragedy by Jeremias Wells. Bookmark the permalink.